OSWEGO – The Oswego City School District opened its doors to thousands of smiling faces in pre-kindergarten through ninth grade on Sept.5. The remaining students in grades 10-12 were set to join the 2018-19 school year Sept. 6. 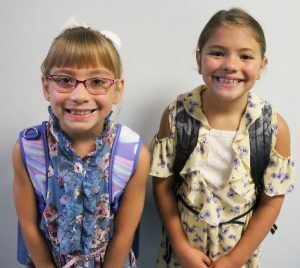 Pictured are twins Layla and Sadie Wilson, who held hands as they visited and hugged their kindergarten and first grade teachers before finding their new classrooms during their first day of third grade at Kingsford Park Elementary School.